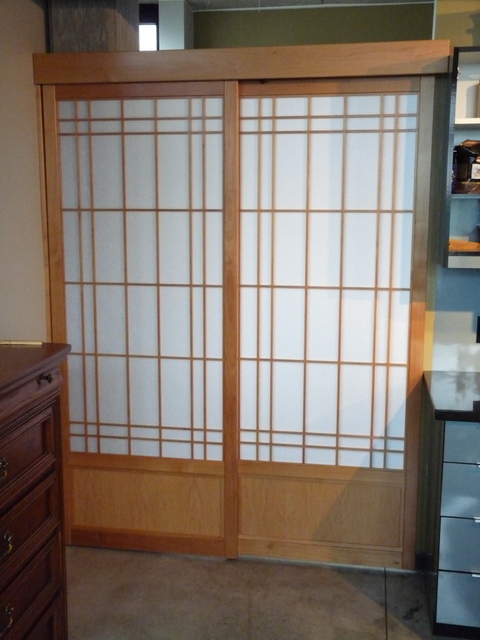 Portland Shoji Screen offers two types of tracks. Traditional style wood upper and lower tracks and aluminum tracks with ball bearing wheeled “carriers” hidden within a matching wood valance box. With metal tracks, a bottom track for guiding the doors is usually required. There are alternatives for guiding door bottoms such as a wood divider, a roller-skate type roller, metal pin set in the floor or even a metal bottom track set into the floor. Each of these has their pros and cons. 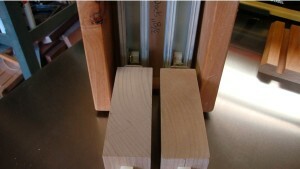 The pins and rollers require the doors to only slide a certain distance. I can totally customize the tracks. Either type tracks can be adjusted to fit almost any size space. Different woods could be used and/or a certain thickness as required. 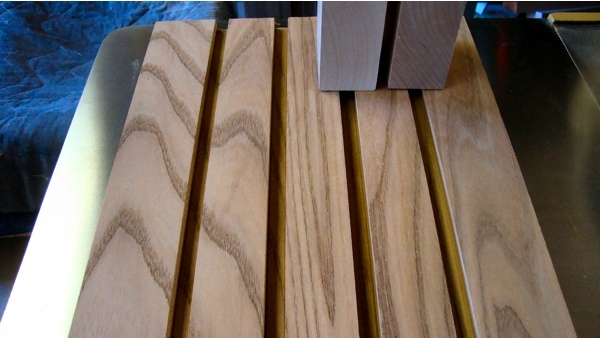 With a 2 track top and bottom and Shoji at 1-3/8” thickness; tracks are 3-1/2” minimum width. The tracks need to accommodate the thickness of the Shoji (typically 1-3/8”, but could be 1”. 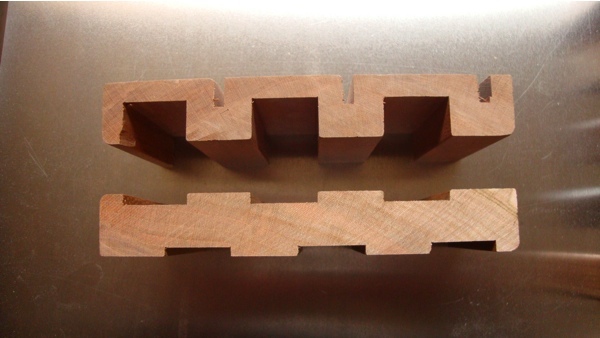 1-1/8”, 1/1/4” etc. 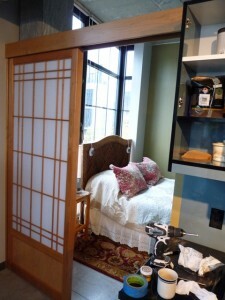 with ¼” spaces between doors) and I can add to the width or bevel one or both sides etc. Tracks can be made of the flooring material, made to lie on top of the floor, or lay in the floor. I can coordinate with your flooring contractor to get the optimum results. The bottom track could be customized to allow for a transition. I can add on to one side or both sides with a bevel. This helps with an opening where there are different flooring materials on either side of the opening. These are popular these days. The originals were very expensive, but now Chinese copies are fairly low priced. 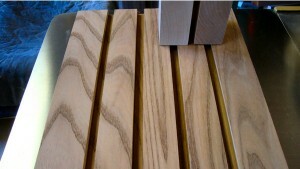 Wood tracks are usually made with the same wood as the Shoji. 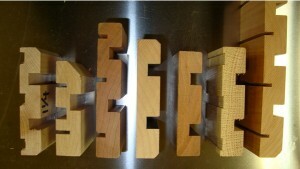 If the Shoji are used heavily, I make them out of Maple or another hardwood. 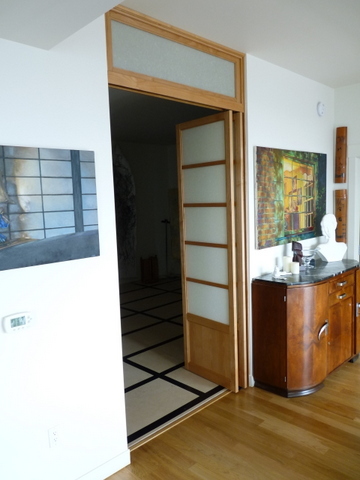 Traditional wood tracks can be very beautiful and really add to the look and experience of the installation. They do require that there is a top and bottom track. The tracks can be modified to fit on top of a typical sill on a window or can be made to hang on the wall over an opening. I wax them up before shipping. They require an occasional waxing with paste wax to keep them sliding easily. There can be drawbacks to using wood tracks. When used on doors; the bottom track sitting on the floor can get clogged with dirt if not cleaned regularly. Shoes worn inside the house; dogs, cats, cows, llamas, etc in the home can greatly exacerbate this. If the Shoji are slid in this grit, the bottom of the Shoji and the track itself can wear oddly and cause the doors to stick. If the installation is to be “within” the opening, and when the Shoji are closed, they touch the jamb of the opening; adjusting the doors to the jamb can be an issue. 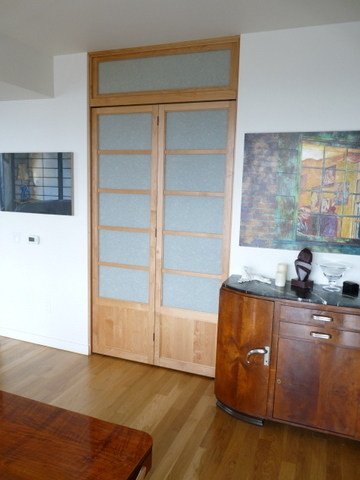 Minor adjustment can be achieved with felt pads or Formica chips glued onto one side, but if used often they won’t last forever. 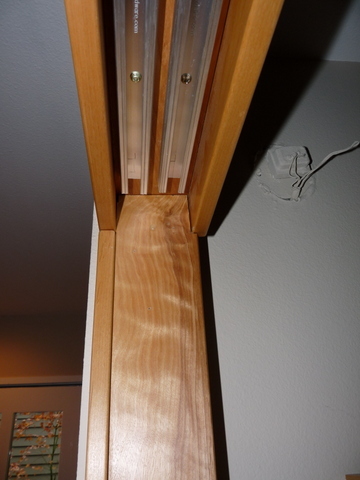 I have used thumbtacks and there are other methods, but most will not stay on or they can wear out over time. On the plus side these not hard to replace. May require jambs to be installed to match the “plumb” of the doors. This happens often as the opening is usually not square to the floor. 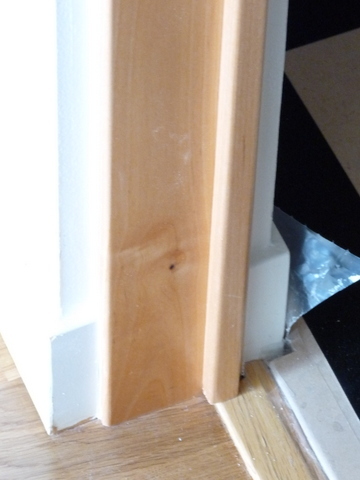 The jambs are installed after the door is sat on the bottom track, then the head piece is cut to fit between them. Makes for a trickier installation. After much research, I mostly use tracks made by Johnson Hardware. I often use their #111 tracks. These are made for light weight doors and feature a ball-bearing wheeled carrier that is trapped inside a sort of “U” shaped aluminum track. For heavier Shoji, I prefer a #200 or #300 which is an I shape extruded aluminum piece with the ball-bearing wheeled carriers trapped on either side. The extruded aluminum track cannot sag, nor do the wheels fall off. 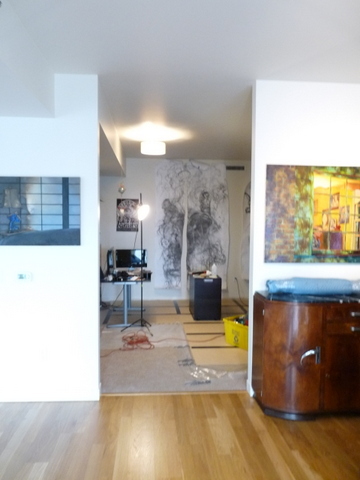 Occasionally the job design will require other brands or the architect will call out a specific brand. I can get anything anyone wants. Grant-Hettich, Coburn, Hefele to name a few. Some of these are very nice but very expensive. I’ve found Johnson Hardware to fairly priced, with great quality. 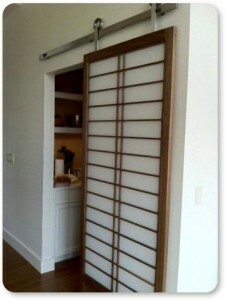 Sometimes the only way to install shoji in an opening is by using Bi-folding doors. They can be installed in multiples or just one pair. Want Shoji to be shorter than the opening is tall? That can be achieved easily with a false beam (with a strong-back inside) to provide something strong to hang the tracks from. 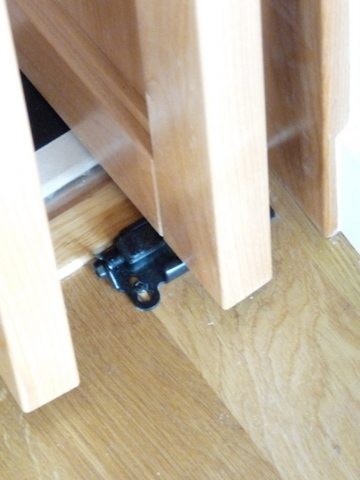 This also works well with wood tracks. 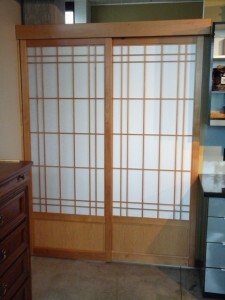 The top area can also have a Shoji or a carving etc. 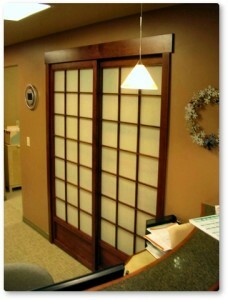 Sort of a stationary transom. Could be made to open if necessary. I suggest visiting the Johnson Hardware website for their expertise. They sell a real nice kit. There are videos on their site. 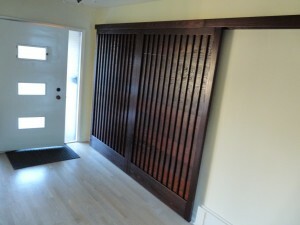 Shoji works perfectly as a pocket door. 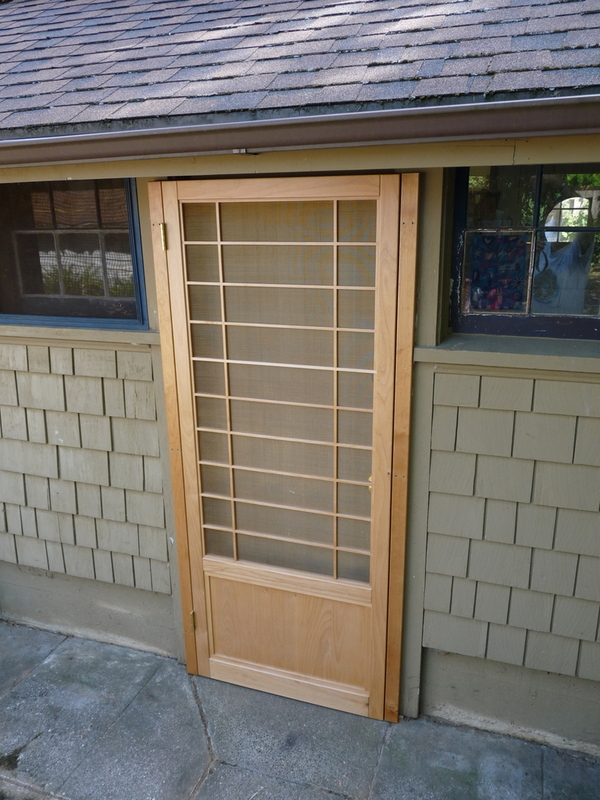 Shoji can also be hinged like a regular door. 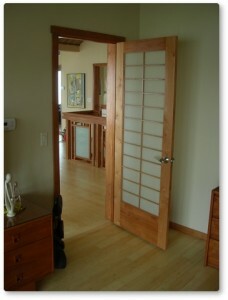 I can build custom sized jambs and “pre-hang” the doors for your carpenters to install, just like traditional doors. Typically the stiles will need to be 4-1/2” wide to allow for typical door mechanisms with a 2-3/8” or 2-3/4” backset. 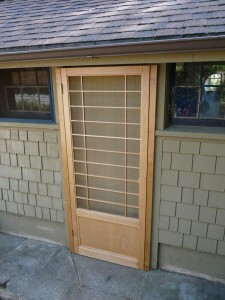 I can also make them about 3” wide and use lightweight “screen-door hardware”.